A true commuter 3 wheel skate! 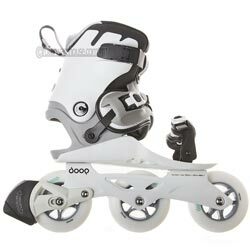 Powerslide Doop Swift 100 inline skates give you a fast & eco-friendly lift from A to B. Doop step-in Triskates are fast, convenient, comfortable & easy to handle, as you can skate them wearing your own shoes. The gray Swift skates combine lifestyle & fitness in a unique new way. Get your workout on 3x100mm wheels & meet your friends afterwards in town. Just strap off your Doop skates & start to walk in your normal shoes to combine skating with social live. Make it a Doop day! The “Doop” base is made of a strong fiberglass reinforced nylon material, which is very stiff and reactive. The wide base can be easily adjusted in length to fit various shoe sizes. To skate with these commuter skates you simply step in with your regular sneaker or sport shoes and off you go with your Blade & Walk skates. The shell also features a combined 165mm and 195mm long mounting distance which means the boot can be mounted on frames with either 165mm mounting standard or frames with 195mm mounting standard. The X-Slot Mounting System offers the skater the unique option to adjust the frame position under his boots in any possible direction matching with his personal preferences. The wide and strong flap of the shell gives the shell a look of a snowboard binding. The padded flap locks the foot perfect in the shell. The “Doop” cuff was designed with support in mind. It is made out of a special composite compound that is super stiff thanks to the 10% fiberglass, which was mixed into the material. The big V-cut of the cuff gives the leg a lot of freedom to flex back. The buckle comes in a classic style. The Powerslide UNITY frames are a unique feature to all Powerslide fitness skates. The frame is a one-piece construction, which makes it lighter and lower than any other fitness skating frame in the market. This results in better stability and more skating fun. The frame is made out of 6063 heat-treated T6 aircraft aluminium to be strong and lightweight, and fits 110mm wheels. The frame uses 8mm axles. The combination of the across slot in the frame and the along slot in our boots is called the X-Slot Mounting. This system enables the skater to adjust the boot-frame setup without any dead spots according to his skating style and preferences. This special feature is unique in the fitness skate category! 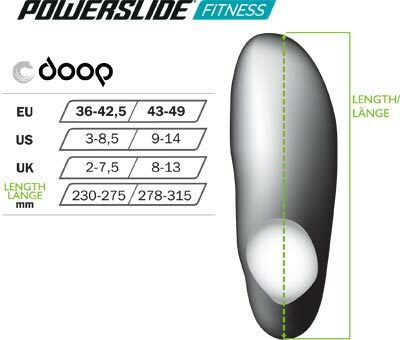 Powerslide is the ONLY skate brand that offers the skater the possibility to adjust the position of his frame fitting the personal preferences and skating skills! This skate is equipped with Powerslide “Doop” 100mm / 85A Super High Rebound performance wheels with a strong and unique 6-spoke core, perfect shape and profile for an excellent push and stride. This wheel is based on the well-known Powerslide “Infinity” wheel. A nice amount of PU over the core to take away shocks and vibrations of the roads, but thanks to the long lasting and super high rebound Urethane these wheels are fast and grippy also at higher speed. The wheel offers overall performance. WICKED (WCD) is a new high end bearing brand specialized for all kinds of rollsport. WCD is made of the best available raw materials and crafted with high quality to guarantee a fast and smooth ride but also long lifetime. WCD ABEC 7 Freespin bearings have a very good and smooth freespin. The bearing contains 7 chrome steel bearings and a light weight but resistant nylon cage. One side is covered by a non contact rubber coated RZ shield. A synthetic oil from Japan is used for this high end bearing. This skate comes with a 2-piece construction. The cuff features a thick and comfortable padding for the leg. The flap features a one piece pre-shaped 3-D padding. It spreads the pressure perfecty to the entire foot. The outside of the padding of the cuff and flap is made of high grade PU-leather material. The cuff features a classic buckle – an easy and effective lacing system. The 45° flap and toe flap also feature a micro adjustable buckle each, which has a lot of power to put pressure on the foot and to keep the shoe perfectly in the shell. The height adjustable brake system (HABS) offers a lot of advantages over the traditional heel brake. The braking surface has a bigger contact area, for a faster and more controlled braking action. The height adjustment function is perfect to find the preferred personal braking position, lower or higher, with straight legs for more braking power or angled legs. Also once worn down the brake pad can be lowered to keep the best braking point for more safety and security. The HABS is for sure the best and most effective heel brake system on the market. Easy to mount to the frame and replace and made out of the best possible materials. Available in different colours for replacement. 3-wheel skates combine dynamic rolling, agility and skating pleasure like no other skate, they are lighter, faster and lower. The different look and feel of 3-wheel skates is breathing new excitement into inline skating, and now, for the first time, skaters from different disciplines like fitness-, speed- or even free-skating enjoy the many advantages of rolling on 3 big wheels.